On the next image and in your dashboard you can see new menu item called “Appearance-> Widgets”. This is where you can add widgets to sidebars. Sidebar is an area where you can place widgets. Our theme comes with with 5 possible sidebar areas: header(1), under title sidebar(2), footer (4), right & left content sidebars (3). Each page can have it our custom sidebars that can be ceated in Theme Options -> Sidebars. You can have unlimited amount of sidebar instances. WordPress Widgets are WordPress Plugins that add visitor visual and interactivity options and features, such as sidebar widgets for post categories, tag clouds, navigation, search, etc. They were originally designed to provide a simple and easy-to-use way of giving design and structure control of the WordPress Theme to the user in the sidebar. 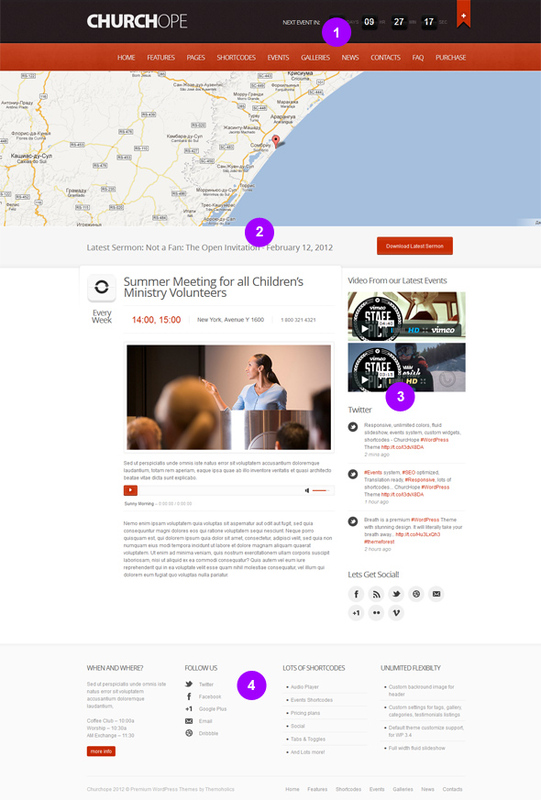 Our theme comes with 11 custom widgets, such as: social links, contact form, flickr, from portfolio/gallery, twitter, email subscribe, upcoming events, next event countdown, recent posts, popular posts, testimonials to make your life easier. Navigate to Dashboard -> Appearance -> Widgets to view your available widgets and widget areas. To create your custom sidebar go to Theme Options -> Sidebars. Simply type name for your sidebar and click “Add sidebar”. After you created sidebar instance in Theme Options -> Sidebars you can find it in Dashboard -> Appearance -> Widgets, at the right side (2). Now you can add widgets(1) to your sidebars(2). Simply drag widgets (1) from the left side and drop to your sidebars (2) at the right side. To add sidebar to your page simply choose it in page/posts layout options at the right side. Also you need to set layout (where to display this sidebar). Our theme comes with fixed widget area for top header area and four widget areas for footer. To add widget to the heaer widget area you need to add widget to the sidebar called “Header Sidebar”. To add widgets to the footer area, you need to add widget to the sidebars called Footer Column 1, Footer Column 2, Footer Column 3, Footer Column 4.